The perfect address for the occasion of a lifetime. 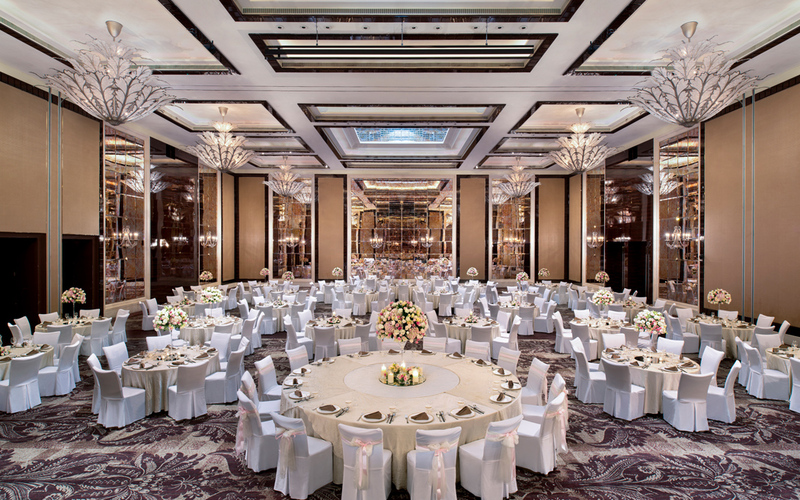 At The St. Regis Singapore, a wedding is a celebration beyond expectation. Opt for an intimate solemnization followed by an elegant wedding reception, or celebrate your special day to the fullest with a grand wedding banquet. Regardless of your choice, our exquisite venues await to be the backdrop to your exquisite wedding. The majestic John Jacob Ballroom has the ability to transform into a charming venue for your solemnization with your near and dear, and into a grand space for a wedding reception to remember. Romantic touches, refined elegance. Your wedding made memorable at the address where timeless elegance resides. At The St. Regis Singapore, your luxurious wedding venue is accompanied by our team of wedding specialists, on hand to execute every moment of your dream wedding perfectly. Each detail is attended to with intimate care. Each moment is a cherished memory in the making. Your wedding of utmost prestige will exude the finest expression of uncompromising service, each moment reflecting our signature of discreet, bespoke experiences.